I have always really enjoyed flying. Where else can you have constant entertainment piped into the seat back in front of you, warm (generally) passable meals delivered to you, and a little pack of seemingly free toothpaste, eye mask, and socks waiting for you? All of this at 33,000 feet while traveling at 500 miles per hour, which is an amazing feat of engineering. That being said, I can’t sleep on planes and have spent too much time tossing and turning uncomfortably on long flights. The difference between arriving at your destination well rested and arriving feeling like you have been beaten up and then forced to stay up for three days straight is the difference between first class and economy…and I’m pretty sure the airlines know that. 1. Remember what was: The first thing is not so much a technique, but a state of mind. Think on the positive side: given the history of price differences in transportation over time, your seat is pretty luxurious. If you had, for example, booked the equivalent of an economy seat on an ocean liner in 1910, there wouldn’t be a life boat for you. Now you have the luxury of a life jacket under your seat and your seat cushion may be used as a flotation device. All-in-all, you have it pretty good. Recline your seat fully. In wide bodied planes, there should now be a fair amount of space between your seat and the wall of the plane. Take one corner of your blanket — you are in economy so it will be paper thin, which is perfect for this technique — roll it a few times so you have a tight roll about the width of your thumb; insert this roll between the glass of the window and the window shade. Close the window shade tightly, it often helps to also pull the blanket up against the corner of the window nearest your seatback. You now have one corner of the blanket anchored to the window. Take the top corner of the blanket and insert it between the seat back and headrest, pull it down tight and it will often hold. If it doesn’t hold, you can knot the blanket to create a catch which will keep it from slipping. 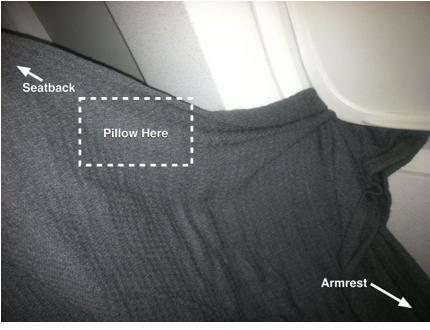 Take the bottom corner of the blanket nearest the wall of the plane and wrap it around the armrest. Take the excess blanket after wrapping it around the armrest and sit on it — thus using your weight to anchor the entire system in place. The whole set up should look like the picture. Finally, put a pillow in the correct location and your jacket in the corner of the seat by the armrest to serve as lumbar support. Test the whole system carefully at first, slowly putting your full weight into the hammock. Once you have correctly positioned the blanket and it is well pinned down at all three points, stretch out and enjoy! 3. Hang your provisions: Never put anything in the seat pocket in front of you! I always travel with a water bottle (generally I bring a 1 liter bottle). This ensures that I have plenty of water during the flight and means that I don’t have to worry about finding clean water to drink immediately upon arrival. I used to put the bottle in the pocket of the seat in front of me. This is a horrible idea, because the seat pocket, when it has even just a little bit in it, expands out into your space and your knees will be knocking it the entire flight. Instead, I now carry a carabiner which I use to hang my water bottle (and sometimes other things) from the seat pocket. This can be adjusted along the full length of the pocket, so you can adjust where you want your hanging supply depending on how your legs are stretched out. And there you have it. There isn’t any magic here. But I will say that I slept like a baby on my last flight to Hong Kong using these techniques. Now if I can only figure something creative to do with those socks they give you other than make a puppet.